Libraries across the country showcased their health and wellbeing services throughout this year’s Health Information Week with the launch of the new Reading Well for long term conditions scheme. The new booklist is part of the Society of Chief Librarians’ Universal Health Offer and provides general advice and information about living with a long term condition, common symptoms, condition-specific titles and support for relatives and carers. 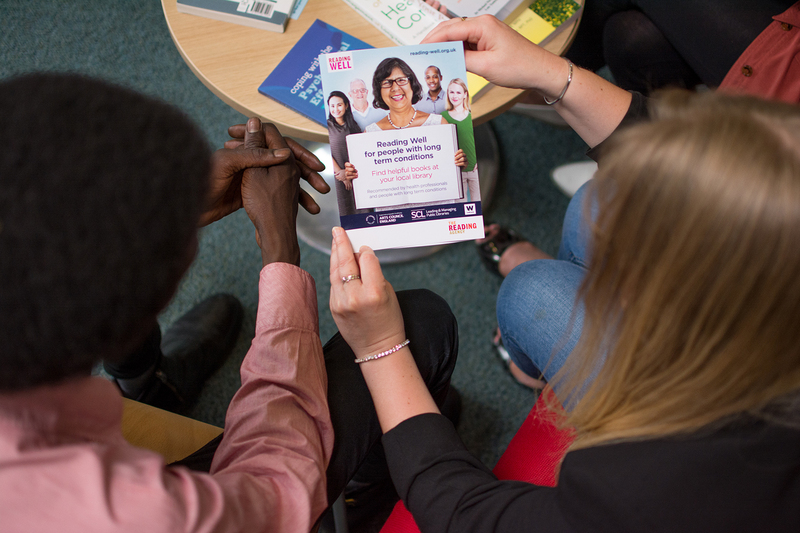 Libraries held events that displayed the diverse range of health and wellbeing services they offer in their local communities. Harrogate library was visited by the Mindful People, who ran a workshop focused on coping with stress, depression and anxiety when living with a long term condition. Norfolk also held a breath, movement and sound relaxation session for their launch attendees. Nottingham City’s event took place at the same time as their regular knitting group which allowed staff to promote their health services to regular visitors, including a visit from a Primary Care Cardiac nurse offering free blood pressure checks and advice on heart health. Coventry libraries have even produced an amazing YouTube video documenting their activities on the day! Many libraries held health fairs with stands from local services offering advice and support. Nottingham, North Yorkshire, Coventry and Norfolk all hosted stalls from local GPs, health professionals, health and wellbeing organizations, patients groups and long term condition charities. Staff at Wakefield libraries and Mid Yorkshire Hospitals NHS Trust visited each other’s sites to showcase the health information they each offer and build partnerships between the two services. Many launch events saw speeches from local councillors and health professionals about the scheme and the importance of accessible, quality assured health information. Activities around the launches were picked up by lots of local media including a fantastic interview with librarian Ceri Brettle on BBC Coventry and Warwickshire Radio (listen from 1:17). Norfolk’s event made the front page of King’s Lynn newspaper, and the York Press and the Runcorn and Widnes World and more also covered their local library authorities’ launches. The new Reading Well for long term conditions booklist is now online. Take a look at our Storify of launch day. Download free resources to help deliver the scheme. Supporting materials are available from our shop.